People Tree’s first capsule edit with the V&A has arrived! People Tree’s first fashion capsule inspired by the V&A has landed for AW17. The collaboration between People Tree and the V&A celebrates the depth and beauty of pattern in the Museum’s archives. The exclusive collection takes inspiration from the 1930s, referencing the elegant outfits of the period yet with a contemporary twist. Romantic long, lean shapes and subtle ruffle details are key features within the collection. “The collection grew out of research in to the V&A’s national collection of textiles and fashion. People Tree has kept the authenticity of the original designs but it’s brilliant to see how they translate to contemporary designs. It is an extremely well-conceived collection that has been fantastic to work on.” Amelia Calver, V&A Licensing Research & Development Manager. The V&A’s prints have played a significant part in establishing the museum’s global reputation for art and design. People Tree’s collection features two prints which are based on dress fabrics originally produced by the Calico Printer’s Association in Manchester, England, now held in the V&A’s archive. The bold seed print is placed onto the softest organic cotton, grown by avoiding harmful pesticides and fertilizers which guarantee that the organic cotton farmers can protect themselves and the environment. The beautiful tulip print pieces are made of Tencel®, a luxury cellulose fibre made from wood pulp. All styles in the collaboration are made by Creative Handicrafts, based in India. Founded in 1984, this dynamic organisation helps low income women in the slums of Mumbai achieve economic independence through training and creation of jobs. People Tree’s V&A collection can do wonders for your wardrobe, the colourful, eye-catching patterns making for a great statement piece. Style for day or evening with simple accessories and let these beautiful prints do the talking! 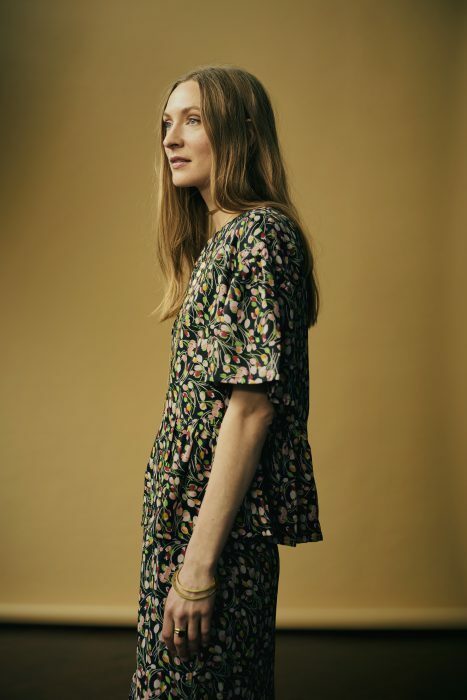 Pieces are available in sizes 8-16 online at www.peopletree.co.uk and selected styles at the V&A as of mid-July 2017. Creative Direction:Tracy Mulligan, Photography: Jo Metson Scott, Styling: Kerry Panaggio, HMU: Bethany Swan, Model: Erika Wall.